Insight Dialogue is a way of bringing the tranquility and insight attained in meditation directly into your interactions with other people. It’s a practice that involves interacting with a partner in a retreat setting or on your own, as a way of accessing a profound kind of insight. Then, you take that insight on into the grind of everyday human interactions. Gregory Kramer has been teaching the practice (which he originated) for more than a decade in retreats around the world. It’s something strikingly new in the world of Buddhist practice—yet it’s completely grounded in traditional Buddhist teaching. Kramer begins with a detailed presentation of the central Buddhist teaching of the Four Noble Truths seen through an interpersonal lens. Because dukkha (suffering or unsatisfactoriness) is often most forcefully felt in our relations with others, interpersonal relationships are a wonderfully useful place to practice. He breaks the Noble Truths down into component parts to observe how they manifest particularly in relationship to others, using examples from his own life and practice, as well as from his students’. He then goes on to present the practice as it’s taught in his workshops and retreats. There are a few basic steps to the practice, deceptively simple to describe: (1) pause, (2) relax, (3) open, (4) trust emergence, (5) listen deeply, and (6) speak the truth. The sequence begins following a period of meditation, and includes periods of speaking, listening, and mutual silence. Kramer includes numerous examples of people’s experience with the practice from his retreats, and shows how the insight gained from the techniques can be brought into real life. More than just testimonials for how well the practice “works,” the personal stories demonstrate the problems that arise, the different routes the practice can follow, and the sometimes surprising insights that are gained. 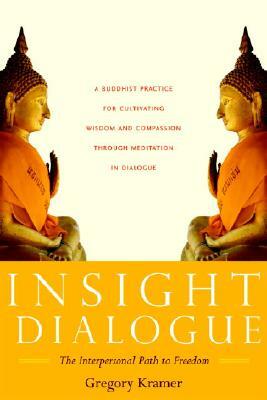 To learn more about the author, Gregory Kramer, go to www.metta.org. Gregory Kramer, cofounder and president of the Metta Foundation in Portland, Oregon, has been teaching Insight Meditation since 1980. He developed the practice of Insight Dialogue and has been teaching it since 1995, offering retreats in North America, Asia, Europe, and Australia.